Finally, we have long day times and bright sunshine over the Netherlands. It calls for having more outdoor activities for me. Then it suggests a good period of time to discover the neighbouring towns of Leiden. As those towns located relatively in the countryside, they offer pleasant moments to upgrade your mood for the ones who like enjoying nature like me. In particular, during the spring period like we are now in where nature has awoken once again and begun to exhibit its long time missed beauties. I had the opportunity to explore Wassenaar when I visited one of my friends living there. It is a worth to see location for the ones who crave for a calm day trip to the countryside and nature. Wassenaar is located in the southwest of Leiden and wonderfully in the centre of the Randstad. It is easily accessible. It takes 30 minutes by bike to arrive there. There is also a direct bus transport from Leiden Centraal which is the Bus Line 43 departing every half an hour. Aren’t the inner city squares always charming? in the heart of the town. There are many stores and cafés in the centre. In addition, there is a famous ice cream shop at the central square called Luciano where they also offer delicious coffee. More than twenty different flavours could make you hesitant as to which one to pick as all of them look equally appetising. This shop gets closed in the winter season and opens its door again with the beginning of April each year. You can also experience local community life in a calm atmosphere while enjoying the sun by sitting outside alongside enjoying the sweetness you have. A Royal Park… A ticket to peace (entrance is free, no worries)… “De Horsten” is a place worth to see for the nature lovers. It covers an extremely large area hosting many different kinds of animals. There are also several determined tour routes within the park guiding you by colourful signs. It qualifies as a Royal Park because it has estates that made built by Prince Frederik. No wonder the royal family chose this area! It also involves a well preserved outstanding lake in the middle where is a natural habitat for numerous breeds of birds. In addition, there is even a cosy teahouse where you can sip your delicious tea after having made a long tour around the park which is full of wonderful views. However, you are not allowed to go into the park with a dog but you are with a horse or a bike. Just keep that in mind! Feel free to bring your horse! Your exam period is over? You wish to step out of Leiden? Then don’t hesitate to give the towns around Leiden a try! Let us know your suggestions and remark in the comments. Cheers! 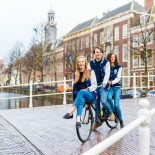 This entry was posted on April 15, 2019 by Tarık Ünal in Leiden, Leisure, Living in Holland, Nature, Tarık_Ünal, The Hague, Travel and tagged Bike, daytrip, horsten, nature, Park, wassenaar.